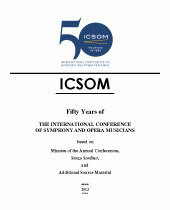 "The First Fifty Years of the International Conference of Symphony and Opera Musicians" by Tom Hall. This is the updated online version of Tom Hall's book previously published as "The First Forty Years of the International Conference of Symphony and Opera Musicians". All four sections of this book are available below as PDF files.